We’re so glad you’ll be joining us. 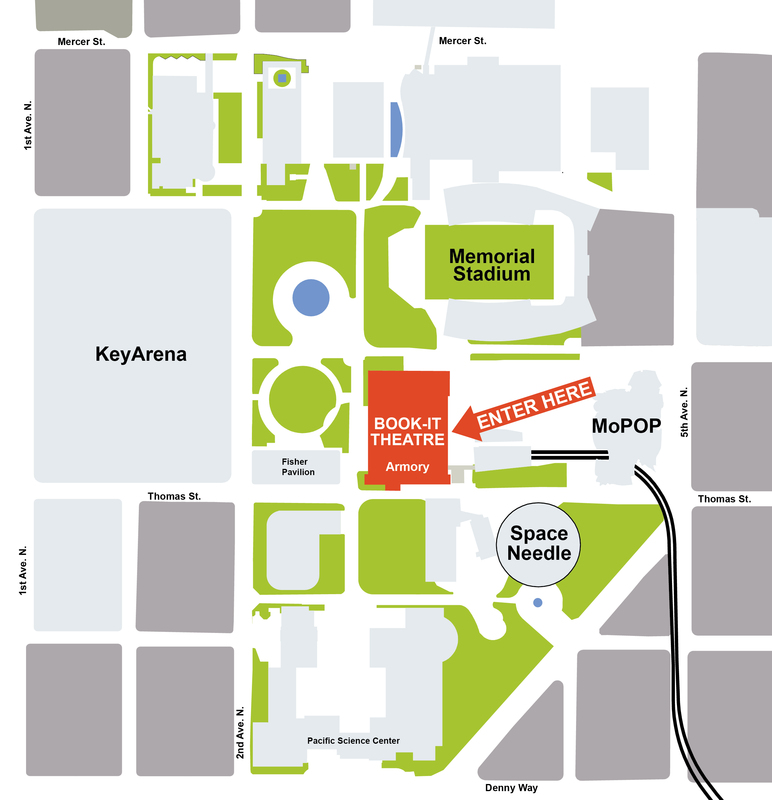 Here you will find information to enhance your visit to Seattle Center and a Book-It performance. If you have further questions, please contact the Box Office (Tues-Sat 12pm-5pm) at 206.216.0833 or info@book-it.org. *Returning the Bones is at The Erickson Theatre (1524 Harvard Ave, Seattle, WA 98122). Book-It generally recommends performances for ages 13 and older. Book-It does not allow babes in arms or children under five. For specific information of the suitability of a performance, please call the Box Office at 206.216.0833 or visit our individual show pages. Most Book-It performances take place in The Center Theatre*, which is located in the Seattle Center Armory (previously known as the Center House) at 305 Harrison Street, Seattle, WA 98109. It is accessible by car or public transit. It’s easiest to get to The Center Theatre if you use the east entrance that faces the playground and MoPop (formerly the EMP). If you’re walking south towards the Monorail and you run into the Chihuly Garden, you’ve gone too far! Are you at the North entrance with the door that says “The Armory” and the giant eagles? Head east towards the playground, hang a right, and use the east entrance. You’ll see a range of people in evening wear to jeans and a t-shirt. Whether it’s dressing up for a special night out or dressing down for comfort, wear what works for you. Please use moderation in applying perfume, cologne, or scented lotion as some patrons have allergies. Care for a snack or a drink before seeing the show or during intermission? We’ve got you covered. Enjoy snacks like assorted nuts, candy, Street Treats, and beverages including coffee, tea, soda, water, beer, and wine. Look out for our delicious specialty cocktail that’s tailored for each show. We take cash and credit cards. You are welcome to take beverages into the theatre; food is not allowed. If you have leftovers, we are able to store them at concessions during the show. Be sure to take a look at our souvenirs to take home something special after each show. We offer a variety of items for purchase including books (of course), posters, and Book-It branded items like t-shirts and mugs. We take cash and credit cards. Please plan to arrive at least 15 minutes before the performance. There is no late seating at Book-It. If you arrive after the show begins, in respect for the integrity of the performance, the safety of the actors, and courtesy to other patrons you may watch the performance on the live feed in the lobby. Ticketed seating not guaranteed after curtain. We regret any inconvenience this may cause, and appreciate our patrons’ cooperation in this matter. Except for emergencies, we ask that you stay in your seat throughout the performance. Please note that those who exit the theatre during the performance will be asked to wait until intermission to return to their seat. Our Administrative offices are located at 401 Mercer St. in the KCTS building. 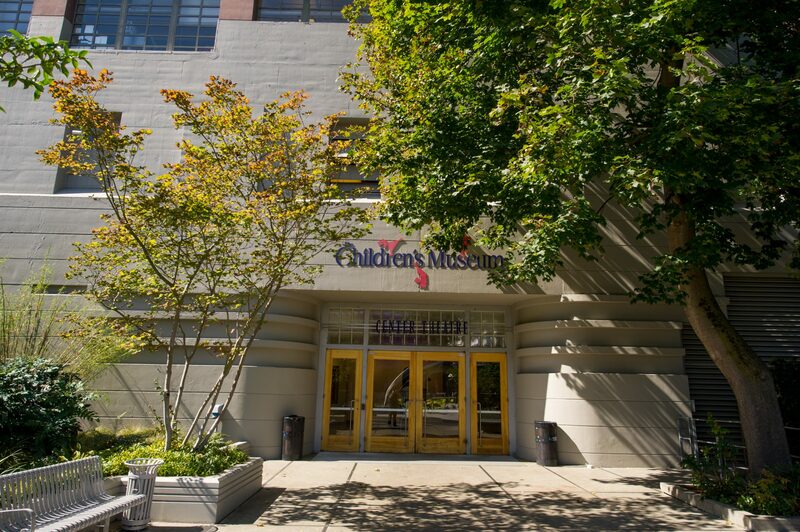 The KCTS front entrance is on 4th/Mercer/Speight Jenkins Way. Go left at the front entrance (you’ll see an orange sandwich board with our logo). Walk along a small section of brick wall and our door is right after that brick wall ends. Book-It Repertory Theatre vows to provide a welcoming space for all peoples without discrimination based on race, religion, ability, or gender. We will not tolerate actions against this commitment. Book-It is committed to providing equitable access to all and ease of use for all transactions and otherwise. Trustworthy professionalism is our goal and we hope to share our brand with openness to changes in the world. If you witness anything not complying with our code of conduct, please alert a staff member.